Throughout the Brexit negotiations, a consistent stumbling block has arisen in questions around cross-border supply chains and future ramifications for trade in Northern Ireland. agendaNi assesses the latest EU exit trade analysis published by the Northern Ireland Statistics and Research Agency (NISRA). Whilst NISRA’s analysis examines several trade flows, it is noted by the authors of the research that a renewed focus on east-west trade has emerged from increasing interest in this aspect of trade, given the United Kingdom’s approaching departure from the European Union. From the outset of the analysis it is noted that Northern Ireland’s economy is closely linked to that of the UK’s, with 64 per cent of £17.1 billion in goods purchased from outside of the Northern Irish economy coming directly from Great Britain. According to the research, the close relationship between Northern Ireland’s and Great Britain’s economies is further demonstrated in Northern Ireland’s £18.8 billion in external sales, with £10.5 billion (56 per cent) of such sales going to Great Britain. A key finding of the research suggests that Northern Ireland’s economy is heavily dependent on trade with both of its neighbours in Great Britain and Ireland; a relationship which “relies upon cross border trade in raw materials and components within integrated supply chains”. Great Britain’s primacy as Northern Ireland’s most significant market to purchase goods from is consistently highlighted in the analysis as “evident across the value of sales, specific industries, business sizes and the transit routes businesses use”. However, whilst the economic relationship between Northern Ireland and Great Britain is demonstrated throughout the analysis, its authors argue that the relationship “cannot be looked at in isolation from other statistics” and must be observed within a wider context of trade with Ireland, trade with non-EU countries and trade with the 26 EU member states. In support of this point, an example is used in the fact that one third of businesses that purchase from Great Britain also sell to the EU, “with Ireland dominating the destination of these sales”. The cruciality of east-west trading relationships forms the central theme of NISRA’s Brexit analysis. This is highlighted across a range of issues, with a particular focus upon the purchasing of goods in both a business and industry context. Within the context of businesses, it is noted that the 66 per cent of the 10,500 Northern Ireland businesses purchasing goods from Great Britain are microbusinesses, which play a key role in sustaining the economy of the region. The importance of microbusinesses is similarly highlighted in the context of Great Britain, with approximately 1,900 British microbusinesses purchasing goods from Great Britain also selling products to the EU. Industry-wise, a smooth economic relationship between Great Britain and Northern Ireland is highlighted as being essential, given their “particularly strong dependency on Great Britain for purchases of goods. These industries include water-related industries, air transport and the wholesale and retail of motor vehicles, where over 60 per cent of all goods are purchased from Great Britain. The impact of east-west trade upon ‘high street’ businesses is outlined as particularly significant in comparison to other industries. According to the analysis, Northern Irish ‘high street’ businesses account for £7.7 billion (70 per cent) of all goods purchased from Great Britain. Of the remaining 30 per cent, the region’s manufacturing and construction activities purchased between £166 million and £498 million in goods from Great Britain. In regard to transit routes, the relationship between Northern Ireland and Great Britain is similarly highlighted as crucial. 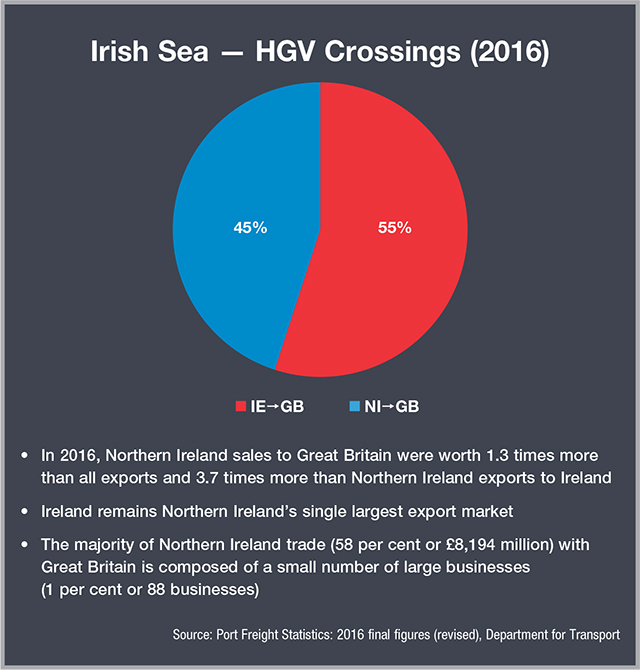 Data published by NISRA demonstrates that the vast majority of goods traded between Northern Ireland and Great Britain are transported directly between them. Notably, it was found that the majority of goods from Ireland traded between Ireland and Great Britain did so via a Northern Irish port. Whilst sales of perishable products from Northern Ireland to Great Britain are frequently cited as using Dublin ports due to faster crossing times, the analysis suggests that of the £2.2 billion in sales of food and drink transported from Northern Ireland to Great Britain, “only an estimated 10 per cent of the value of these goods were transported through Ireland”. Indeed, the document highlights that the Department of Agriculture, Environment and Rural Affairs (DAERA) found that “just over half” of Northern Irish agri-food subsectors reported that they transported goods through Ireland to final destinations. The importance of cross-border supply chains is highlighted in NISRA’s Cross Border Supply Chain Report, which defines cross-border deliveries as an “export from a Northern Ireland business to a business or household in Ireland, or an import from a business in Ireland to a business in Northern Ireland”. The Supply Chain Report notes that provisional estimates indicate that NI VAT and PAYE registered businesses made over 758,000 cross-border export deliveries to Ireland, estimated to be worth some £3.4 billion to the local economy in 2016. In addition, the analysis also notes that in 2015, import deliveries from Ireland to Northern Irish businesses were worth nearly £2 billion. The importance of microbusinesses to the local economy is again highlighted in the Cross Border Supply Chain Report. Indeed, most cross-border transactions were made by micro and small businesses “which dominate the Northern Ireland economy”, with 74 per cent of export deliveries involving businesses with fewer than 50 employees. 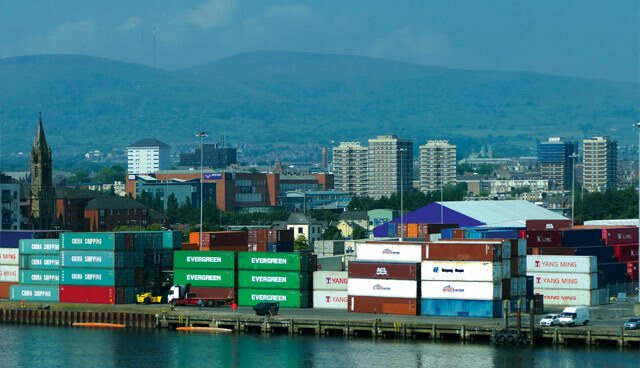 Notably, NISRA’s analysis found that Northern Ireland businesses exporting to Ireland made an average of nearly 100 deliveries valued at approximately £4,500 per trip in 2016, with low-value deliveries accounting for less than a fifth of the total value of exports. The Cross Border Supply Chain Report describes the Northern Irish economy as one which is small, open and “integrated into trade with the Rest of the European Union (REU) and the Rest of the World (RoW)”, with 62 per cent of trade with the REU meeting the wider definition of Supply Chain activity. The analysis found that Northern Ireland was much more likely to trade in capital goods with the REU and RoW than with Ireland. According to the publication, this represents “further evidence of Northern Ireland’s integration into markets beyond these islands”. In its conclusion, the report calls for further research into the intricate web of cross-border connections and trade between Northern Irish businesses and businesses and consumers in Ireland, due to the current level of understanding presenting “only a partial picture of the movement of goods across the border”.